Tone might be in the hands, but you need more than your mitts and a clean amp to bring that heavy-rock masterpiece to life. The list should include skull-caving midrange, bowel-loosening volume, and the kind of military-grade saturation banned by NATO in 12 countries. 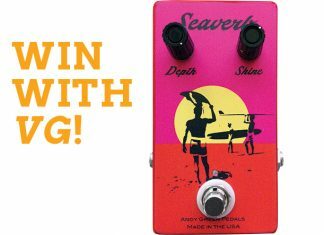 MXR’s Double-Double Overdrive allows you to lead a double life, playing gigs requiring unobtrusive wedding band overdrive and gigs calling for late-night high-gain head bludgeoning – all with a flip of a switch. 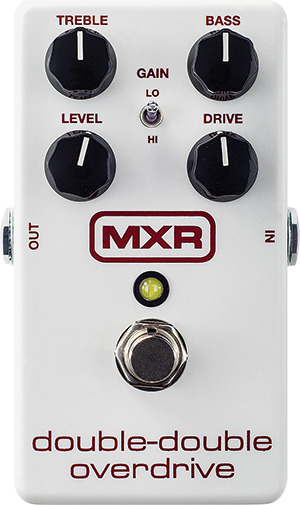 MXR pedals are famous for their solid construction, ease of use, and spectacular sounds. The Double-Double is no different. Essentially two classic overdrives in one, its layout is as simple as it gets, with controls for Treble, Bass, Level, and Drive. It takes a 9-volt battery or adapter and has an on/off LED. The Double-Double’s secret weapon is its two-position Gain switch. Toggle between a classic Japanese overdrive circuit or a modern American overdrive for torso-cleaving lead tones. The Gain switch’s Lo setting offers malleable overdrive from rugged amp breakup for rock or blues, to cranked truculence with a slight volume increase. The Drive knob is the ticket to ushering in a variety of dirty tones in the Lo setting, and while this circuit emphasizes midrange, the EQ controls allows you to adjust frequencies to taste. On the Hi setting, thick distortion emerges with harmonics aplenty. With the Drive knob maxed and the EQ controls set at 12 ’o clock, highs and lows are emphasized for that aggressive scooped sound reminiscent of the ’90s. Both circuits are adjustable and cater to guitarists seeking warmer, thicker, overdrive sounds. Not having these two settings foot-switchable is an oversight, but the Double-Double offers responsive grit and makes a great addition to your sonic tool belt.